A truck driver is heading west across the Arizona desert. He has been driving all night, and as the sun starts to rise, he feels the need to stop and commune with nature. 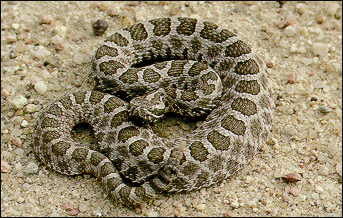 He pulls to the side of the road, parks, and walks out into the sage brush. As he is standing there, looking around at the beauty of the early morn, he notices a lever sticking out of the ground. After a few moments, he walks over, walks all the way around, and then reaches out to grasp the lever. Just as he does, he hears a voice say, "Don't touch that lever." The driver jumps about two feet off the ground, and as he comes down, he looks around. No one is to be seen. Thinking it was just his imagination, he again reaches for the lever. Again the voice yells, "I said don't touch that lever!" Being more prepared, the driver senses the location of the voice and looks down under a sage brush. There he sees a small snake. The driver, in much astonishment, said, "Was that you that just spoke?" The snake said, "Yes. I have to keep people from touching that lever. If the lever is moved, it will be the end of the world." The driver, still rather astonished, said, "What is your name? And will you talk on TV?" The snake said his name was Nate and that he wasn't interested in going on TV; anyway, he had to stay and watch the lever to see that it wasn't moved. The driver said, "Look, I will get the networks to send out camera crews. That way, you can inform the entire world about the danger of the lever." Nate thought that over and allowed as how there was a great deal of sense to the idea. The driver, true to his word, got the network camera crews out. They put on broadcasts in which Nate warned the entire world of the dangers of moving the lever. A few weeks later, another truck driver was going through the area. He was following an oil tanker, and the tanker sprang a leak. When the driver's truck hit the slick, it went out of control, and he found himself headed straight for the lever. He remembered seeing Nate on the TV telling about the lever and so he knew that if he hit it, he would cause the world to end. He strove, with all his might to maneuver the truck. Finally, at the last moment, he was able to swerve, but he ran over Nate, the snake, and killed him flat! This is kind of like the Readers Digest condensed version. A while back I came across a version with the same punchline but the joke seemed to go on forever. It wasn't even presented as a joke where I saw it and only after spending the time to read the whole thing did you get the gag. Here is a link to the longer version. Yes, this condensed version leaves much to be desired. So you really wanted to read the longest joke in the world and then find out it's a shaggy dog story? "My dog isn't THAT shaggy"
We used to call these "feghoots"! I love them!